The child who is not embraced by the village will burn it down to feel its warmth. I discovered this African proverb just after writing this piece and marveled at how applicable it is to a hunch I have about our national penchant to shoot people en masse. Two more mass shootings makes it time to begin seeking what contributes to the psyche of a killer. What makes one act like this? Among the many contributing factors, I want to present one in particular for your consideration: Killing is the only way the killer can share his pain and belong to something larger than himself. In the same way we all need to be recognized and belong to one another, this is how the killer gets recognition. He finds belonging for his pain by killing others to join him in his torment. Numerous factors assist his mission. 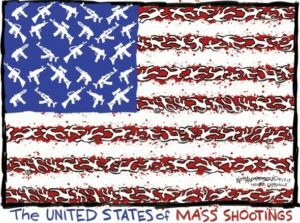 Each mass shooting becomes a highly publicized and media-driven event. The multi-faceted anatomy for these tragedies is shared virally on social media and in the news, eventually reaching billions far and wide. Second: helpless, hopeless, troubled people who are candidates for hate crimes see the flash and splash these crimes create. This serves several functions: 1) the publicity reveals the design and strategy of a massacre 2) it gives a future killer the notion that it’s possible for an ordinary person to make a dramatic difference and 3) it shows the attention a killer can receive, how to become a movie star of sorts overnight, and be acknowledged by millions. Through the media, a troubled and despondent person who otherwise might not have just enough gusto to commit a hate crime can glean the reality of what otherwise seems unimaginable. They learn a way to finally matter if they can so profoundly affect so many people and get the attention they’ve always wanted and missed. They can finally belong, even though the meaning and belonging are of the ugliest, most evil kind. Mass shootings show how painful it can be to exist without mattering, with deep suffering of this magnitude. But what causes some to express their pain violently and others to suffer quietly? Some propositions include isolation, medication side-effects, fatherlessness, and the general cultural malignancy of America. Perhaps those who possess a perfect storm of vulnerabilities turn viral when they reach a threshold of suffering. This can then push them over the edge to execute the final hate crime, with the help of media attention. No matter the price, no matter the ethos, we need to matter—somehow, we need to belong. We need to share ourselves and feel we are not alone. We are deeply social organisms, and pioneering neuropsychiatrist Dan Siegel goes so far to say that our minds and nervous systems are necessarily intertwined with one another. When we can’t meet this need to belong through joy or compassion, our suffering seeks it via destruction. And when extreme, we may seek it via death—suicide and/or killing others. In a strange mix of pathological anger and a twisted desire to be loved, a killer destroys what he most wants yet can’t seem to have. Each life the killer takes represents the love from a human he could not get, and a positive life experience he couldn’t have or relate to. In a final act of annihilation, in absurd paradox and irony, he joins their life-force by imposing his grim inner reality (feeling dead inside) onto them. Social isolation, the inability to alleviate emotional pain, despair and desperation, a broken social and economic system, and not nearly enough help for the disenfranchised among us, might create the breeding ground for such hateful acts of violence. The need to matter and inextinguishable suffering might cause some to lash out to try to accomplish destroying all they have desired. The killer acts in a final, dramatic way to end his own suffering while taking from others the life he could never have. This is the closest he can come to receiving love, as perverse as it is. In a sense, it is an act of extreme envy and retribution for how he feels cheated by life, propelling him to destroy that life. Until we can create more equality, tend to our personal and collective pain, care for one another as much as we do for fame, fun, and money, and rebuild a community of caring for those left out, we will find the most perverse ways to belong, to feel a part each other’s lives. Ideally, we accomplish this in joy and in sustainable, shared sorrow. When we can’t, our need to belong goes unmet and we seek it however we can. One who feels dead inside kills to share and belong in the only way he can—by forcing others to feel as dead as he does inside. None of this means that we should wait for a revolution in collective consciousness to reduce mass shootings. We can work at this evolution while we either ban or make weapons used for mass shootings more difficult to attain. This alone has been shown to be effective, as other countries’ stricter gun laws demonstrate. I offer this particular dynamic as possibly underlying the psyche of mass murderers. Even if these parameters don’t correlate with decreasing mass murders, they make us a better people. Just as the child who is not embraced by the village will burn it down to feel its warmth, one who cannot find belonging will kill those he would otherwise be recognized by so he can finally belong . . . to anything. Jack Adam Weber, L.Ac., MA, is Chinese medicine physician, having graduated valedictorian of his class in 2000. He has authored hundreds of articles, thousands of poems, and several books. Weber is an activist for embodied spirituality and writes extensively on the subjects of holistic medicine, emotional depth work, and mind-body integration, all the while challenging his readers to think and act outside the box. His latest creation is the Nourish Practice, a deeply restorative, embodied meditation practice as well as an educational guide for healing our core love wounds. His work can be found at jackadamweber.com, on Facebook, or Twitter, where he can also be contacted for life-coaching and medical consultations.